In the software there is a concept of a "Lead" which is sort of a light-weight inbound contact request. Web forms and inbound emails will generate these. You can flip on a setting to have the system automatically convert these to Tickets if possible - meaning if there was enough information present for a valid ticket to be generated. We also recently added a concept of a "Mailbox". This is sort of like the standard email mailbox, it's an email address. This is the way you can setup support@yourcompany.com to pipe into your account. Using Mailboxes you can configure on a per-mailbox basis if you want an autoresponder to be sent, or if it should just make a Lead, or try to convert all the way to a full fledged Ticket. Ok - So the "best" way to do this is to go to create a "Mailbox" that will have your email on it, then configure the Autoresponder settings there in the mailbox. First - head to Admin, Mailboxes, and click "New"
Put in your email like "support@yourcompany.com" and give it a name, hit "Create Mailbox"
Next you'll need to "Activate" this mailbox, this is just a simple step that tells us if you have forwarded your email address correctly. Follow the steps to forward your email address to us, setup your SPF record if you want, and then send us that test email. 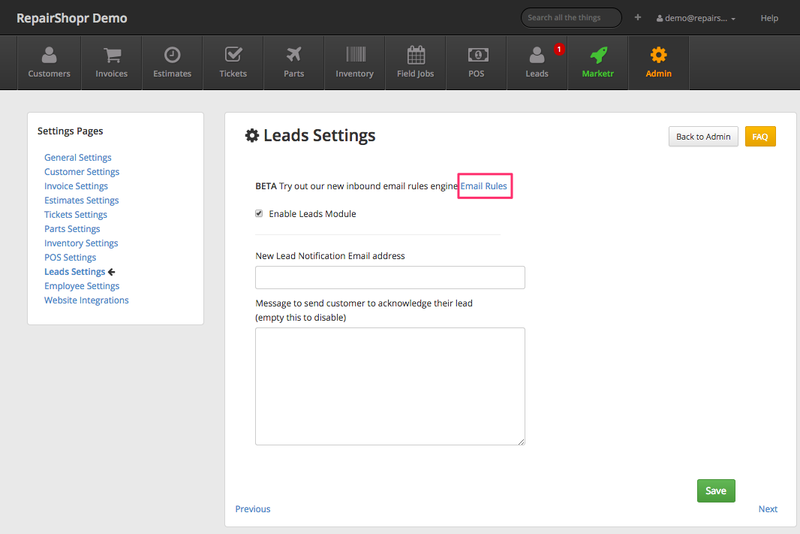 Automatically create tickets from emails to this mailbox - if unchecked, emails will create Leads. If checked, they will try to make a Ticket. If you are unable to activate your Mailbox, be sure to whitelist the forwarding address to prevent the system from blocking it. First you'll need to enable Leads. (Admin > Leads Preferences). This makes the system process your inbound emails differently to support this feature. Which email address should I give to customers? The inbound email alias email defaults to yourbusiness@reply.repairshopr.com. For details on which email to use or how to use your own email domain see our article here. If you are using a Mailbox you do not need to change anything as the mailbox does not use the subdomain in the address. To have incoming emails automatically converted to tickets if the sender of the email matches an existing Customer (or a Contact of the Customer), navigate to Admin > Ticket Preferences and select "Create Tickets from Leads". This setting affects any inbound email to your email alias that isn't already another type of classifiable message, like a reply to an existing Ticket or Estimate. These rules will give you power to assign UNKNOWN inbound email to a customer, or even a contact under a customer. Think of these fields as a 'search' - so you can input partial address/subjects and we'll apply the first rule that matches. 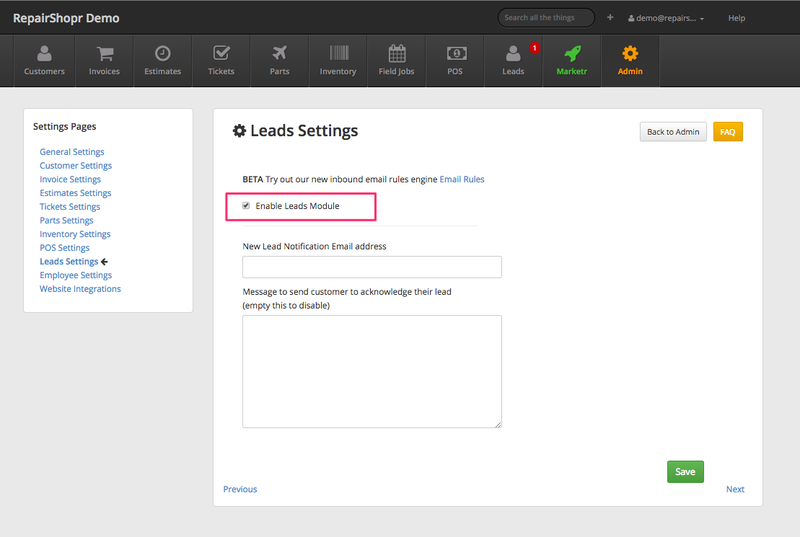 You can create Email Rules by navigating to Admin > Leads Preferences and clicking on "Email Rules". Maybe you want any emails with the subject containing "medcorp" to attach to your customer called "Medical Corp". Just create a rule with the subject filter having "medcorp" and attach the email rule to that customer and add a dot (period) in the email field. Perhaps you get emails from many employees at the same company, and you would like to auto-create a contact for every new email that comes in to the system. Just create a rule with the "Email Address" set to their domain, eg, 'medcorp.com', and then any inbound email that contains their domain will attach to the correct customer. 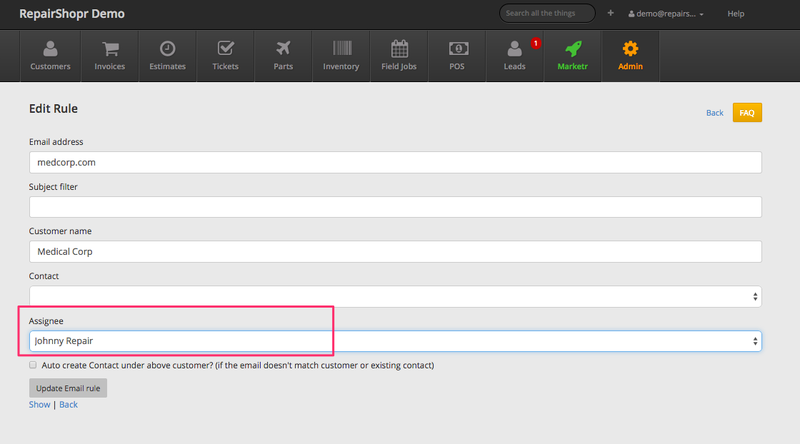 You can also check the box "Auto create Contact" and if there isn't a contact, we'll create one for the resulting Ticket. 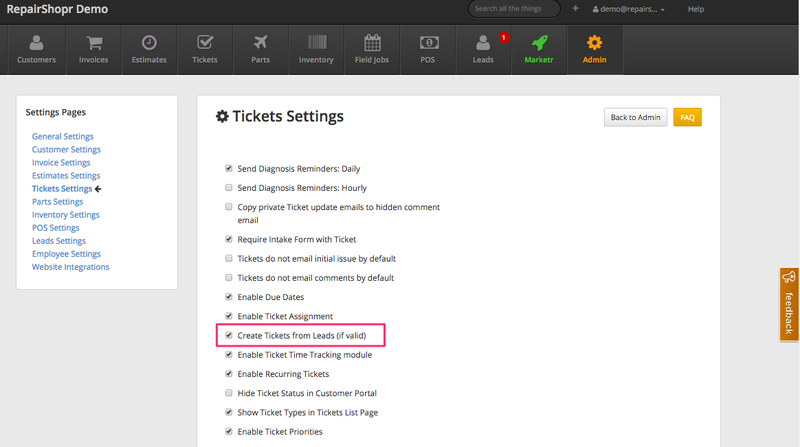 If you are auto-creating tickets from your leads, you can even have the rule auto-assign the ticket to one of your employees. You can create and manage Email Rules at a customer level from the Customer Detail screen. To do this, head to the Customer Detail page for the customer you want to manage. Then, click the Edit button > Custom Fields. Once there, you can enter your customer domains and Email Rules will be automatically created and attached to your primary mailbox. There is a new section on the Customer Detail screen called Email Rules. From there, you can manage the differing Email Rules for the customer. Note: Email address cannot use popular free email services as Mailbox Rules are designed to work with the domain. Using a popular free email service would cause all the emails from that domain to go to a single customer, so they are not available for use. If you want to forward customer emails into the system, we've added a special bonus for you: just forward it in from an email that is a User Account and the resulting Lead/Ticket will have the customer information attached properly! It is also possible to send a email in to your Mailbox and attach it to an existing ticket. Add the instructions below to the subject of the email. You can use this from tech tools or other automated systems to automatically attach documents/logs to tickets. "TICKET" must be capitalized followed by a colon then the ticket number you wish to attach the email to. If you have automatic ticket creation turned on and a customer sends you a email with someone CC'd on the email, then the CC'd person will be attached to the ticket as a Additional CC automatically.